Toe spreaders are thicker than the separators and because the polymers soft conforming properties, these spreaders are extremely comfortable. Sold in packs of 4. 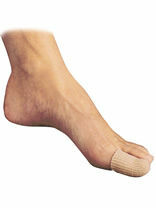 Anatomically molded to fit comfortably between toes reducing shearing and inter-digital pressure. Can be trimmed is required. Sold in packs of 15. Half coated with medical polymer gel with the same applications as the digital pad but in a strip, allowing you to choose the length needed with absolute comfort. Each pack contains strip 60cm (24") ie. 20 toe protectors. 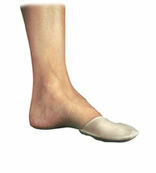 The moulded disc of Silipos soothing and moisturising gel is ideal for corns, blisters, nail bed injuries and calluses. Number of pads on strip from 17 to 11 depending on size. 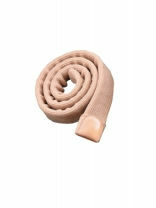 Gel foot covering made from a thin layer of gel covered on both sides with fabric and offers complete protection which is ideal for activities that are stressful on the toes. Sold as a pair. Fully lined with Silipos polymer gel, the digital cap is ideal for all-round digital protection and is used extensively in sports for pressure and friction protection. Sold in packs of 8. ONE SIZE 17MM. Podopro gels are specifically designed to offer practitioners a cost effective alternative to the market leading Silipos range. Manufactured using similar mineral oils and hardwearing materials, these gels are extremely economical without compromising quality.